Long before the Christians claimed credit for enunciating the Golden Rule, it was the ancient Greeks who started it off. By all reports, Jesus of Nazareth gave the Rule its positive spin – do unto others as you would have them do unto you. The Greek spin was negative – don’t do to others if you don’t want them to retaliate. The Jewish versions of the Rule are a bit guarded. That’s because they distinguish between neighbours and brothers on the one hand; to them the Golden Rule applies. But enemies on the other hand – they get whatever is coming. That’s also the Ukrainian version of the Rule. 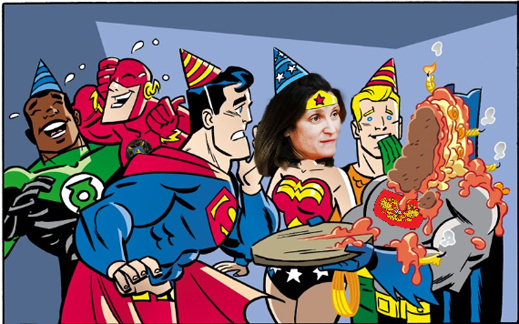 This explains why Chrystia Freeland, Ukrainian by blood, homeowner in Kiev, and Foreign Minister of Canada (lead image, centre), thinks the Golden Rule in its Christian version applies between Canada and the United States, but not between Canada and Russia, China, Iran, Venezuela, Syria, Libya, and when she thinks circumstances call for it, Japan and other members of the Trans-Pacific Partnership (TPP) — Australia, Brunei, Chile, Malaysia, Mexico, New Zealand, Peru, Singapore, and Vietnam. Last weekend Freeland’s boss Justin Trudeau, the current Prime Minister of Canada, got what the US Government thinks he had coming. That was because the Americans say he was duplicitous and deceitful in negotiations. They say Trudeau agreed with President Donald Trump in private, but then when Trump’s back was turned, Trudeau announced to his Canadian electors that he won’t allow Trump to push him around. For details, read this. The US Government attack was a coordinated move by the White House spokesmen for both the president and for the principal US cabinet departments. Left: US Trade Representative Robert Lighthizer. 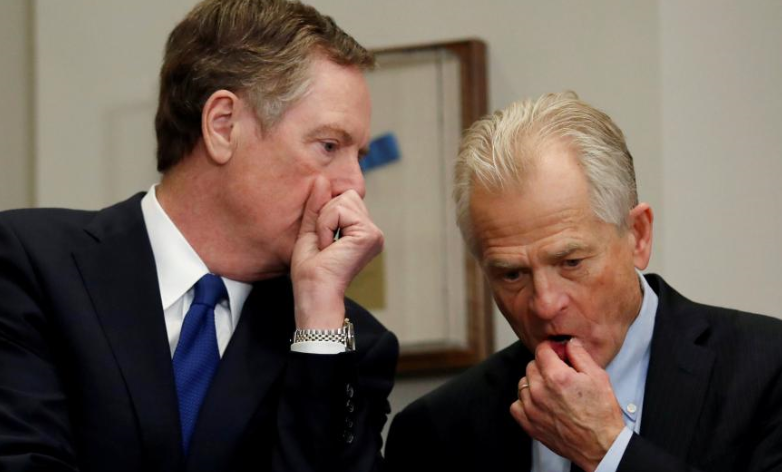 Right: Peter Navarro, White House advisor on trade. Freeland hasn’t defended Trudeau. At first, in a Québec City press conference on Sunday, she attempted in halting French to tell reporters the US attack on Canadian steel, aluminium and automobiles is “illegal” and “absurd”. Two days later she repeated the claims after a closed-door meeting in Washington with a group of US senators. They are trying to pass new legislation to curb presidential national security powers; Freeland told the senators she is placing Canada on their side in the fierce constitutional battle still to be fought. Freeland, US political analysts observe, is not against the application of US national security legislation to economic warfare campaigns against states Freeland believes are national security enemies of Canada. These include 25% penalty tariffs and outright bans on trade against enemy steel, aluminium, automobiles, and in the Russian case against production of oil and gas, as well as the entire Russian banking system. Left to right: Champagne, Freeland and Trudeau negotiate with Ukrainian President Petro Poroshenko and his delegation in Toronto, September 22, 2017. The official photograph reveals that Trudeau’s staff had placed the Ukrainian flag on the side of the table occupied by Freeland. Last November Champagne and Freeland defended Trudeau for doing in trade negotiations with Canada’s Pacific region allies exactly what Trump has just attacked Trudeau of doing to the US. 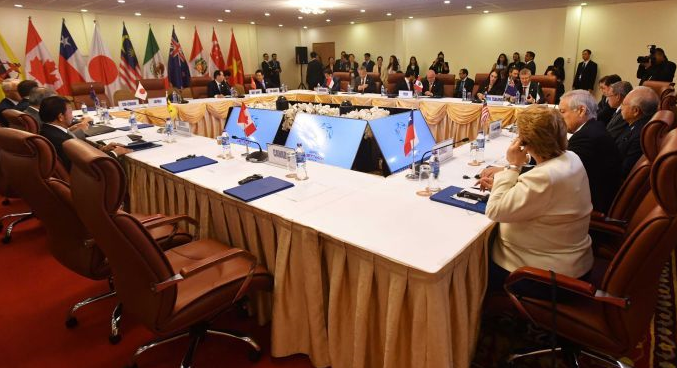 During the Asia-Pacific Economic Cooperation (APEC) summit negotiations in Vietnam, Trudeau agreed to sign the “in-principle” version of the Trans-Pacific Partnership (TPP) agreement, but then refused to show up for the official signing. “There were a lot of unhappy leaders left sitting there,”said an [Australian Government] official who was in the meeting. “Everyone was screwed,” he said. 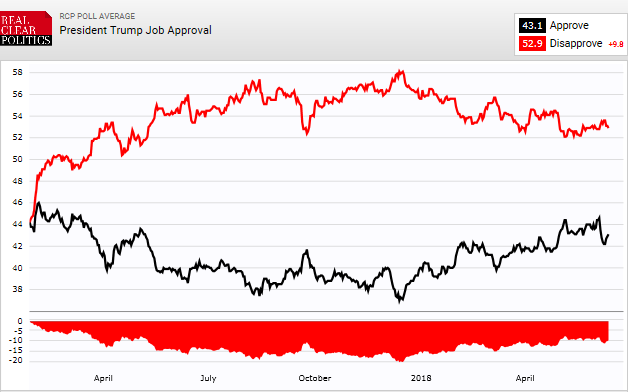 For Freeland and her supporters in the Liberal Party to believe it is wise for Canada to side against the Trump Administration on the trade powers issue pits that policy against US polls revealing the attack on Canada was designed to boost Trump’s job approval ratings with American voters – and did. In Moscow and Beijing Freeland’s continuing attacks on Russia, China and other enemies have been dismissed as flatly contradicting the “the rules-based international trading system…open, transparent, inclusive and WTO-consistent”, which the G7 communique endorsed (but which Trump refused to sign). In Qingdao, following a summit meeting of the Shanghai Cooperation Organization (SCO), President Vladimir Putin was dismissive. 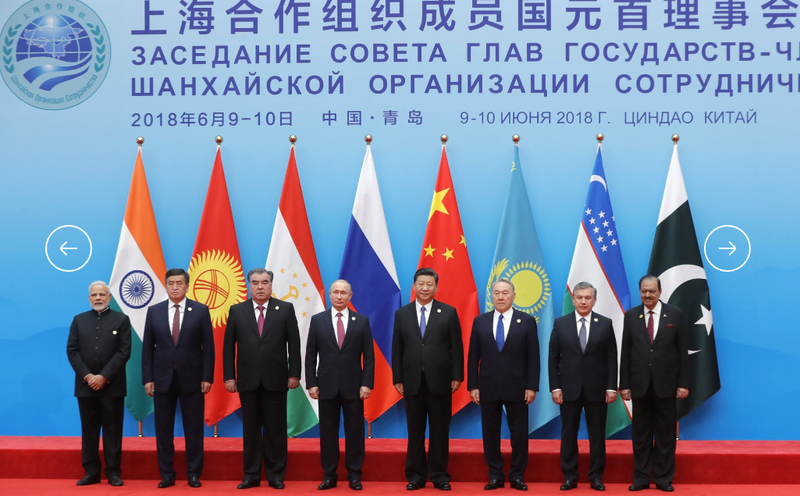 The SCO meeting of June 9-10 included India (left) and Pakistan (right) at the summit level for the first time. Iran and Mongolia also participated at the head of state level. For details of the SCO as a regional strategy alternative to the TPP and G7, read this. For details of Purchasing Power Parity (PPP) and Russian economic performance, click to start and then read this.